It's back! 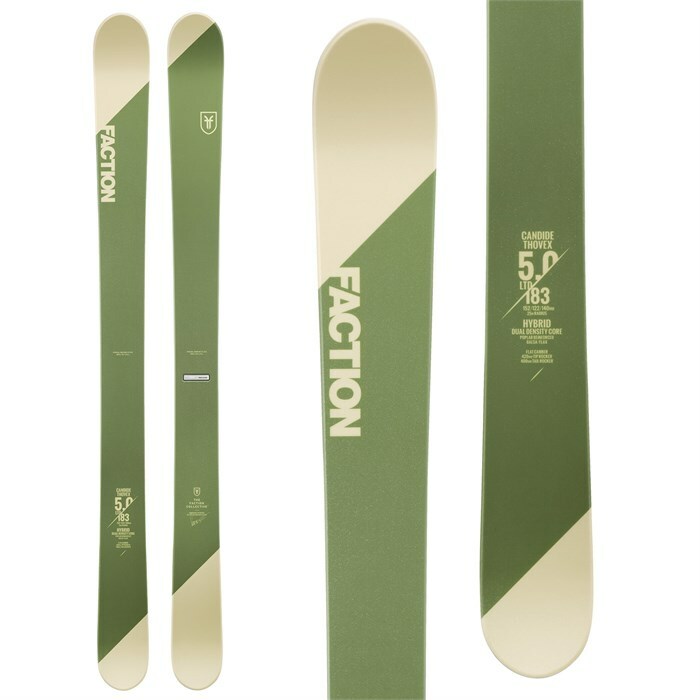 A revival of the original ski that Faction developed with Candide, the Faction Candide 5.0 LTD Skis boast the same ripping sidecut, super slashable pivot-on-a-dime feel, and gloriously girthy waist width but with a new hybrid core and more durable sidewall construction. The result? A powder ski that'll have you so excited to ski the storm cycles that you might just give up on even trying to maintain a real job... We can't promise that these will make you ski like Mr. Thovex, but we can promise some of the most memorable deep-day turns of your life. With limited edition badging on each of the 200 available pairs, you'd be foolish to sleep on this opportunity to get your paws on a pair! Rocker / Flat / Rocker  420mm rocker in the tips. Flat (zero camber) underfoot for maneuverability, quick pivots and slashes. 400mm rocker in the tails. Stiff Flex - 8/10  Designed to provide bite and stability in steep terrain and variable snow. Directional Twin  A considerably skinnier tail width than in the tip provides ultimate downhill performance for attacking the mountain. A twin tip in the tail encourages playfulness and freestyle attitude, meaning you can ride switch without problem. Hybrid Balsa-Poplar-Flax Core  Balsa is a sandy-colored softwood with exceptional strength for its light weight. Reinforce the super lightweight Balsa with earthy-colored, robust Flax fibre plus Poplar strips and you have a durable wood core that holds an edge like skis twice the weight. During the drying process, cells of water in the Balsa wood are driven off, leaving behind a strong core with no excess weight. Phenol Binding Plate  Phenol reinforcement plate laid on top of the hybrid balsa/flax core ensures binding screws hold like nothing else and add durability to these super lightweight cores. Anti-Chip Micro-Cap  Micro-cap construction is a hybrid of two construction techniques: a premium, sandwich sidewall construction fused with a lightweight, durable cap construction. With micro-cap, the sandwich construction provides awesome edge hold and torsional stability while the ski's topsheet wraps around and meets the sidewall, protecting the fragile joint that can be prone to chipping. Limited Edition Plate  Every pair is unique, equipped with a metal plate underfoot indicating it's number out of 200. Big Mountain Big mountain skis are designed for charging big lines with high speeds and big airs. These skis varry in width from wide, powder-oriented skis for skiing Alaska spines to narrower, mixed condition skis for ripping the beat up headwall at your local mountain. Skis in this category tend to be on the stiffer side, often with more rocker in the tip and less in the tail. Powder These skis are for the deep days. If you like to find powder stashes at your local resort, go on backcountry missions for the freshest of fresh or heli ski trips to BC, powder skis are what you need to stay afloat. Skis in the powder category are wide and most often have some form of rocker or early rise plus a relatively soft flex. Many powder skis today are versatile enough to handle mixed conditions and harder snow. Rocker/Flat/Rocker Rocker/Flat/Rocker is a variation on the rocker theme that seeks to provide a little more hard snow edgehold and pop than full rocker while retaining ease of turning and float. Performance is between a fully rockered ski and a rocker/camber/rocker ski.